It’s difficult now to appreciate the shock caused in 1967 by the mix of comedy and violence which divided critics but thrilled audiences. The skewed morality of the Depression, when banks were perceived as the rankest of villains and the police as no more than their enforcers, chimed perfectly with the anti-authoritarianism of the late Sixties. One of the great ‘what ifs’ of cinema – the original choice of director was François Truffaut, leading light of the French New Wave, but who had already committed to filming Ray Bradbury’s Fahrenheit 451. The project passed to Warren Beatty who (after a Hollywood Who’s Who? of refusals) convinced Arthur Penn to direct. Penn’s ahead-of-its-time mythologising of the cool outlaw couple echoes Jean-Luc Godard’s A Bout De Souffle. Another Nouvelle Vague director, Godard famously eschewed studio sets, taking his camera out on the streets of Paris and, apart from a few interiors at Warner Bros in LA, Penn’s film was likewise made on many real locations, this time around Dallas, Texas. Many of the small towns in the area had changed little since the Thirties, and even some of the remaining banks robbed by the unlikely couple were able to be used in the film. Small-town girl Bonnie Parker (Faye Dunaway) lights up like a megawatt bulb when she claps eyes on Clyde Barrow (Beatty) attempting to steal her mother’s car and the charismatic badboy is soon impressing her with a glimpse of his weapon. It’s not a bank but a grocery store that Clyde chooses to rob to demonstrate his credibility. The Depression-hit town where the couple introduce themselves, is Venus, on Route 67 about 20 miles southwest of Dallas (a town also seen in 1985 drama The Trip To Bountiful). The business used as ‘Ritt’s Groceries’ can still be seen, though it”s been remodelled to become the First Baptist Church Annex, on Walnut Street at 2nd Street. It turns out that Clyde Barrow is guilty of false advertising when it comes to getting it on with the enthusiastic Bonnie (the explicit bisexuality of the original script is replaced by impotence), but she nevertheless remains entranced and the pair hole up in an old farmhouse. The property, recalling The Grapes Of Wrath, repossessed by ‘Midlothian Citizens Bank’ was the Burkhart farm, just east of Rowlett, about 15 miles northeast of Dallas. Clyde’s first bank job turns to be no more impressive than his studly prowess. The single remaining employee of the sad little ‘Farmers State Bank’ reveals that the company has gone out of business and there’s not a cent left on the premises. 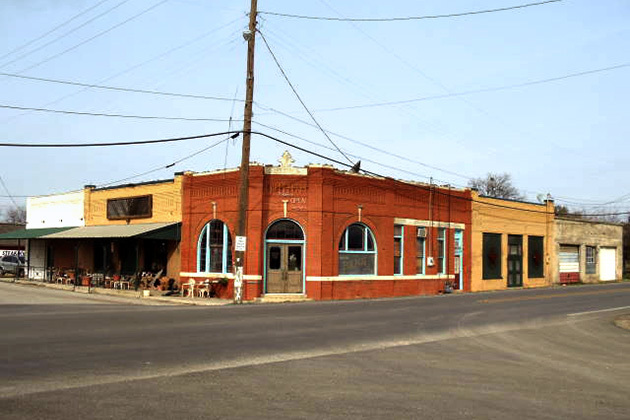 The building can be seen in the tiny town of Ponder, ten miles west of Denton. It’s 100 East Bailey Street at Farm to Market Road 156. 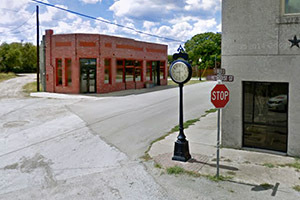 Just outside Waxahachie, a much-filmed town 20 miles south of Dallas (seen in productions such as The Trip To Bountiful, Tender Mercies and Places In The Heart) stood the old gas station where the pair recruits motor mechanic CW Moss (Michael J Pollard). A major change in the script was needed to accommodate the inspired casting of Pollard in a role originally written as a hunky jock who joined B&C in a ménage a trois. It’s Moss’s lack of experience as a getaway driver that scuppers the otherwise exemplary robbery of the ‘Mineola Bank’. Rather than wait outside with the engine running, Moss considerately takes the time to park correctly in the nearest space. The ensuing juxtaposition of slapstick comedy and sudden shocking violence is typical of the film’s daring tone. The spruced-up red-brick bank can be found on the corner of Waller Street at Methodist Street, in Red Oak on 35E about 15 miles south of Dallas. Despite having notched up their first killing, the couple are fast on the way to becoming folk heroes, and this notoriety sees them scuttle off to ‘Joplin, Missouri’ to lie low for a while with Clyde’s older brother, Buck (Gene Hackman) and his highly-strung wife Blanche (Oscar-winning Estelle Parsons). Buck and Blanche’s home, virtually destroyed in a shoot-up when the fugitives are tracked down by the law, was 1717 Caddo Street in Old East Dallas, northeast of Downtown. The house itself has been rebuilt and much of the street redeveloped since the Sixties, but you can still recognise the apartment block on the northwest corner of Caddo and Roseland Avenue as the newly-formed ‘gang’ makes its getaway. The team is becoming slick and decidedly cocky as they hold up the ‘Farmers and Merchants Bank’. “We’re the Barrow boys!” boasts Buck enthusiastically before they make off. 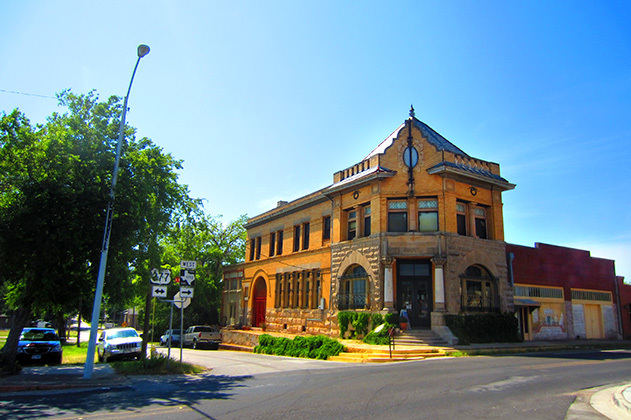 The old bank lives on as an art gallery – the Farmer's & Merchant's Gallery, 100 North Washington Street, in Pilot Point, about 40 miles north of Dallas. Among the careers kickstarted by the movie was that of Gene Wilder in his first screen appearance as dithery undertaker Eugene who, with his wife Velma (Evans Evans) gets taken along for a manic joyride. The gang steals Eugene’s car from outside his house on the northwest corner of East Church Street and South 4th Street, in Crandall, on US175, 20 miles southeast of Dallas. The town of Crandall itself is featured toward the end of the film. When Eugene casually reveals his profession, the laughter ends abruptly. Along with Velma, he’s unceremoniously dumped from the car. Bonnie begins to realise that time is running out and, aware that death is no more than a couple of steps behind them, feels an urgent need to connect with her folks one more time. The bittersweet family idyll, heavy with melancholy, was filmed in an old quarry filled with sand back at Red Oak. The scene is dreamily diffused by cinematographer Burnett Guffey, with a patch of screen door slipped over the lens. The tone continues to darken with a police ambush which sees Blanche blinded and Buck killed. The bloody ‘Ring of Fire’ shooting filmed at Lemmon Lake, a privately-owned preserve on Trinity River a few minutes from downtown Dallas. Wounded, Bonnie and Clyde recuperate in the house of CW’s father (Dub Taylor) in ‘Arcadia, Louisiana’. Seemingly sympathetic, Moss Sr sells the couple out to the cops to cut a deal for his son. The town of ‘Arcadia’, where Moss Sr meets up with vengeful Ranger Frank Hamer (Denver Pyle) in the ice cream store is Crandall again. It’s here on Main Street that Bonnie and Clyde are spooked by cops and fatefully choose to head home without CW. The real-life killing of Parker and Barrow took place in Dexter in Carroll County, Iowa, about 80 miles northwest of Des Moines, just north of Route 30. The film’s spectacularly graphic (for 1967) hail-of-bullets ambush was one of the few scenes not filmed in Texas, but at the Russell Ranch, now developed as Westlake Village in Triunfo, near Thousand Oaks, northwest of Los Angeles.